Plan du Port de Chequetan ou Seguataneo a 17 Deg: 36 Min de Latitude Septe. / Plan van de Haven van Chequetan of Seguataneo Leggende op de Noorderbreette van 17 Gr. 36 Min. 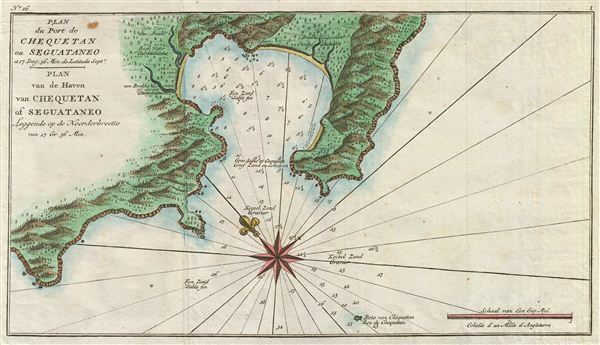 An extremely attractive 1765 map of the Mexican harbor of Zihuatanejo by George Anson and Jan van Schley. Details the harbor beautifully showing mountains, waterways, and trees as well as offering detailed depth soundings and nautical references. Zihuatanejo is a stunningly beautiful resort area in Guerrero, Mexico, about 250 km north of Acapulco. This area was originally named Cihuatlán in Aztec, which means 'Place of Women,' referring to the matriarchal society that dominated the region in pre-Columbian times. This map was drawn by the British Admiral George Anson just before his historic capture of the Spanish treasure galleon Nuestra Senora de Covadonga. During Anson's circumnavigation of the globe he and his crew, charmed by the beautiful beaches and tropical climate, wintered and resupplied in Zihuatanejo before daring the Pacific and making history. Local legends claim that Anson plated the region's first coconut groves. It is further said that some of Anson's crew mutinied; burning several ships, and married locally, settling in Zihuatanejo while Anson and remaining crew sailed westward. The unusual Zihuatanejo family name 'Verboonen' is said to derive from one of these unions. Though Anson makes no official record of mutinies at Zihuatanejo, he did lose some six hundred men and several ships – could some of them be here? Prepared as plate number XXXI for inclusion in the 1765 Dutch language issue of Anson's Voyage round the world… The Dutch edition of Anson's voyage is notable for its superior presentation over other editions, including completely re-engraved map plates, courtesy of the Dutch master engraver Jan van Schley.